Note: The open source version of pmview is currently under development, and is not yet shipped as part of PCP GUI, but is available for experimental use in the development source tree. Visual tools take advantage of common cognitive skills, especially for visual pattern matching and scene change discrimination. The motivation for visualization of performance data is very similar to that used for engineering visualization, visual simulation, and database mining through visualization - visually rich representations of complex data sets are powerful aids to understanding and detection of unexpected relationships. Move the cursor over each block in the scene. Take time to read the (changed) text box above the 3D scene and understand what it is telling you. In particular, identify the source of the metric, the name of the metric, the instance of the metric, the current value ... can you explain what "millisec / second" really means? Click the left mouse over one block in the scene. How is this different? Click on the "Live" button or Ctrl-T or Options -> Show Time Control from the menu bar. In the PCP Live Time Control dialog, experiment with changing the update Interval (this is the interval at which new metric values are fetched from pmcd ). Quit with File -> Quit or Ctrl-Q. 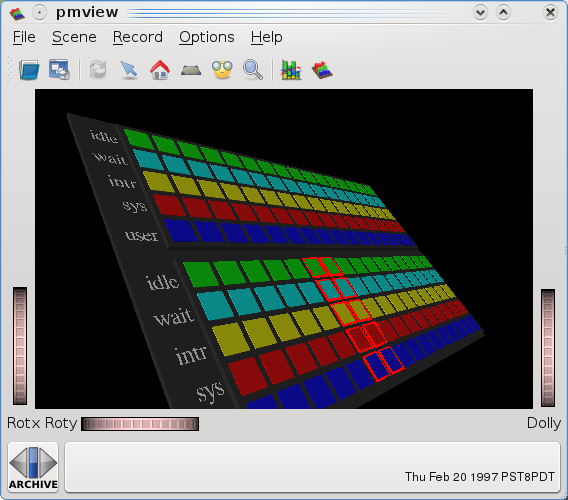 In the dkvis window (above the top left-hand corner of the scene) change the Scale to be 5 using either the thumbwheel or the text box to the right of the thumbwheel. In the associated PCP Archive Time Control dialog, changing the update Interval to 2 minutes (remember to Enter after you have changed the Interval text box). Double click the Play button. When the replay finished, drag the slider in the PCP Archive Time Control dialog back to near the middle of the range and release the slider. Back in the dkvis window, move the cursor over each block in the scene. Take time to read the (changed) text box above the 3D scene and understand what it's telling you. In particular, identify the source of the metric, the name of the metric, the instance of the metric, the current value ... can you explain what "count / second" really means? Select all of the blocks for controller dks1 (use "Shift-select" to do multiple selections), and then Launch -> pmchart from the main menu. In the pmchart window use File -> Open View from the menu bar to add the LoadAvg view. This is a "drill-down" example. Use the PCP Archive Time Control dialog again - this time notice that you're controlling movement through both dkvis and pmchart using the same time control window (that's because pmchart was launched from dkvis ). Quit from dkvis . Notice that pmchart and the pmtime dialog remain. Quit from pmchart . pmafm is a folio manager which allows you to work with a folio of archives for many visualisation tools; in this case, with the folio godzillaweb . The text file pmview/example.view specifies a pmview configuration having one baseplane with one bar containing three metrics (5, 10, and 15 minute load averages), and separate bars for each of the disk read and write metrics. An a learning exercise, copy example.view and modify the configuration so that instead of having the disk metrics as two separate blocks (bars), they appear as a single stacked bar showing both metrics, one on top of the other. The osvis tool we saw earlier uses stacked bars for memory and CPU utilization. 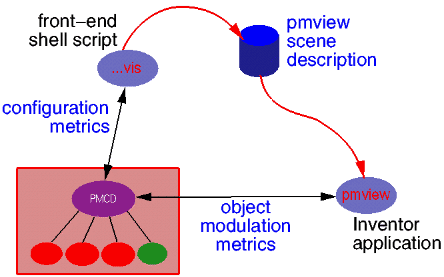 The pmview(1) man page describes the pmview configuration format in detail. Look for the _stack object.